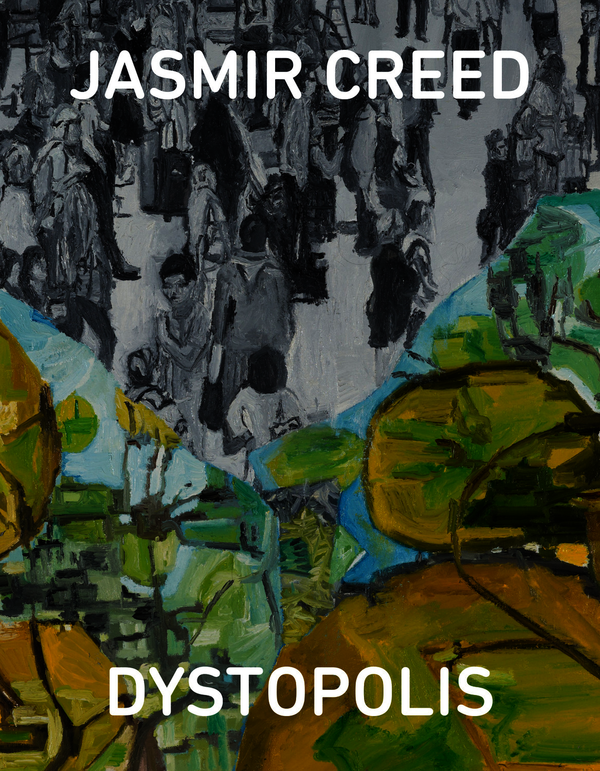 Dystopolis presents new paintings by Jasmir Creed at the Victoria Gallery and Museum, Liverpool. Critical texts by Dr Lauren Elkin and Dr Graeme Gilloch explore the images and ideas in Creed’s paintings in cultural contexts. ‘[The] city rendered through the artist’s perceptive gaze, and her creative body’ Lauren Elkin. ‘This is the neo-noir city as shadowscape’ Steel Webs (2016). ‘Here it is not so much the brute inertia of stone and concrete that contrasts with the spare aerial tracery of steel and glass, but rather the human populace as a murky mass lurking, loitering’ Graeme Gilloch. ‘Paintings of my psycho-geographic journeys through cities especially London, Manchester and Liverpool, focus on architecture and crowds. My images reflect how geographical locations affect emotions and behaviours e.g. tensions between the individual and collective corporate culture, as seen in people and city tower blocks. Images contrast multiple viewpoints expressing feelings of alienation and flux in the jostling movement of people in city spaces showing the city as a rich forest-like environment of the known and the unknown. The unsettling architecture that I see is domineering, creating a dystopic sense of a metropolis, illustrating an atmosphere of alienation in the urban environment, as an individual confronting crowds weaving through cities.’ Jasmir Creed. Jasmir Creed is an artist, whose work comprises production of paintings, collaboration with curators, exhibitions as well as audience engagement through talks and workshops.